Are Electronic Arts' Earnings Worse Than They Look? When you are trying to buy the market's best stocks, it's worth checking up on your companies' free cash flow (FCF) once a quarter or so, to see whether it bears any relationship to the net income in the headlines. That brings us to Electronic Arts (Nasdaq: ERTS), whose recent revenue and earnings are plotted below. Source: Capital IQ, a division of Standard & Poor's. Data are current as of last fully reported fiscal quarter. Dollar values in millions. FCF = free cash flow. FY = fiscal year. TTM = trailing 12 months. 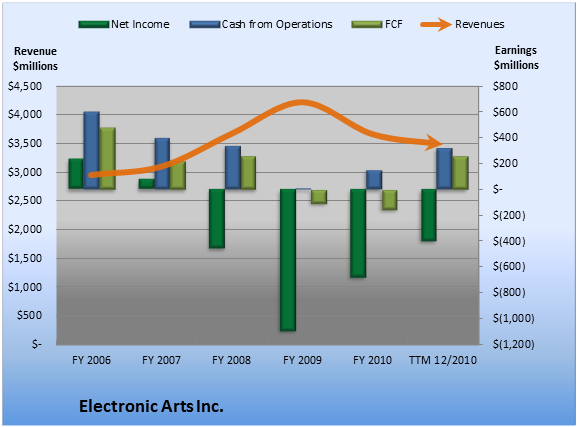 Over the past 12 months, Electronic Arts generated $260.0 million cash on a net loss of $397.0 million. That means it turned 7.5% of its revenue into FCF. That sounds OK. Still, it always pays to compare that figure to sector and industry peers and competitors, to see how your company stacks up. Source: Capital IQ, a division of Standard & Poor's. Data are current as of last fully reported fiscal quarter. Dollar values in millions. FCF = free cash flow. TTM = trailing 12 months. 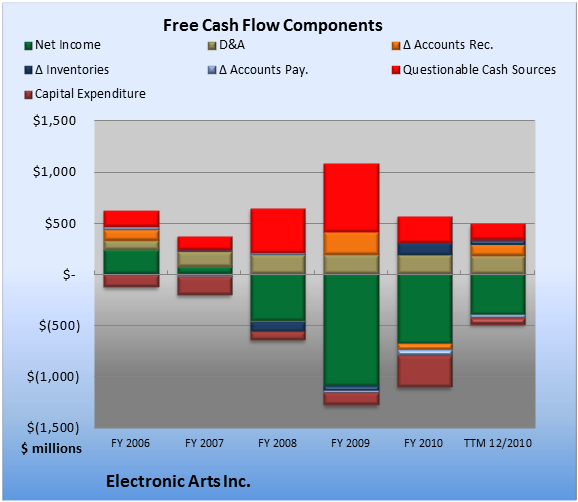 So how does the cash flow at Electronic Arts look? Take a peek at the chart below, which flags questionable cash flow sources with a red bar. Source: Capital IQ, a division of Standard & Poor's. Data are current as of last fully reported fiscal quarter. Dollar values in millions. TTM = trailing 12 months. With 48.1% of operating cash flow coming from questionable sources, Electronic Arts investors should take a closer look at the underlying numbers. Within the questionable cash flow figure plotted in the TTM period above, stock-based compensation and related tax benefits provided the biggest boost, at 56.3% of cash flow from operations. Overall, the biggest drag on FCF came from capital expenditures, which consumed 18.8% of cash from operations. Add Electronic Arts to My Watchlist. Add Activision Blizzard to My Watchlist. Add Konami to My Watchlist. Add RealNetworks to My Watchlist.